Favorite Nashville running trail in the scenic Percy Warner Park. Narrow trail with many hills. The trail is open year-round, but can be slippery when wet or icy - take care! 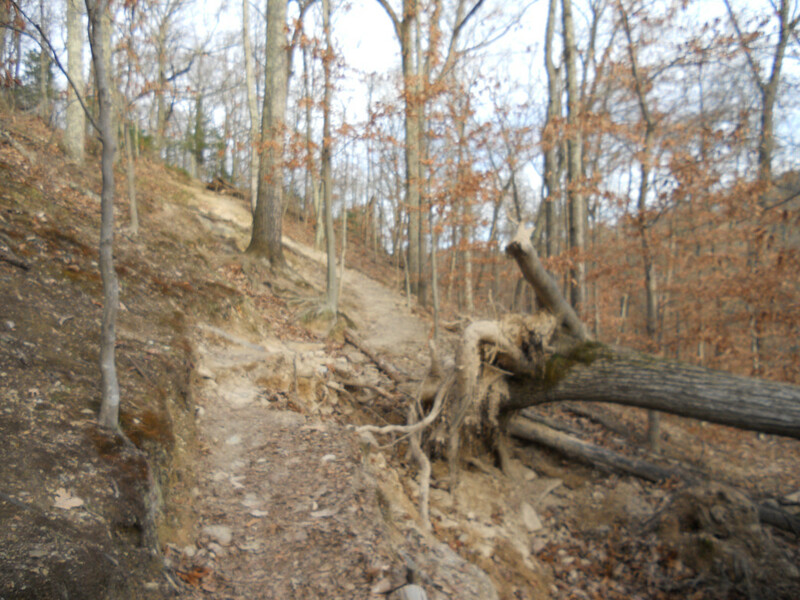 The Mossy Ridge Trail is a favorite trail for running in Nashville. This gorgeous trail makes a 4.5-mile loop through the best of the park's diverse natural habitats. The scenery changes all the time as the trail rolls up and down hills, giving stunning views through the woods, across the valleys and out towards Nashville to the north or Edwin Warner Park to the south. This is a truly beautiful natural trail that goes deep through the woods, while within a half-hour drive of Nashville's city center. This trail takes you through amazing natural scenery, and it's of only moderate difficulty. There are ups and downs in terms of elevation, but the trail surface itself is relatively smooth and free of rocks, roots or muddy patches. Runners can get onto the loop and enjoy a rewarding run that is not highly technical. This is truly an all-season trail, from its spring wildflowers to summer shade and vibrant fall foliage that gives way to a festive and frosty mossy winter. The relative ease of the trail means you can be on the lookout for nature, and there is plenty -- deer, turkey, owls and the occasional bobcat grace the trail with their presence. An interesting "dripping springs" area sees the trail cross a rocky zone where springwater seeps and drips. Note that this is not a viable water source and there is really no water available once you're on the Mossy Ridge Trail - you need to bring your own hydration. There are plenty of trash receptacles along the trail, so you could bring and dispose of water bottles if you wanted. The trail gets out of the woods and crosses several open meadows, which open up the view and offer a change of scenery. Around Scott Hollow, the trail is fringed with lush green moss - here, as elsewhere on the trail, there are regular resting benches if you want to take a break and take in the scenery. City-dwelling runners looking to get away from the pavement will love this trail and its diverse wild landscape. A 4.5-mile loop is not too long, and if you want to run further there is always the option to make multiple circuits of the Mossy Ridge Trail, or to connect with the Cane Connector Trail (1 mile) and the Warner Woods Trail (2.5 miles). The trail is quite narrow, and those with vertigo may find certain hillside sections a little frightening. Considering the risk of falling, take extra care when the trail may be icy or wet. Mossy Ridge Trail, like the other trails in Percy Warner Park, is open from daybreak until 11 p.m. daily. The park is a fragile natural environment, and so it's important to stay on marked trails and avoid damaging any fragile vegetation. Parking is available at the Deep Well trailhead and also near the Chickering Road or Cheekwood park entrances. It's possible to park in small areas just off the paved road running through the park. The park is well supplied with trash collection, with receptacles trail-side. Portaloos are provided at the Deep Well trailhead. No hunting or weapons are allowed in the park; dogs must be kept on a leash no longer than 6 feet.